Travelling to the Alps – to Fly or to Coach? For young children there’s nothing more exciting than Christmas. So when we flew to Ruka in Finnish Lapland on Christmas Eve 2017, to meet Father Christmas as he is known in our house and get involved in everything from skiing to dog sledding, it’s safe to say excitement was at dangerous levels – and that was just the adults! 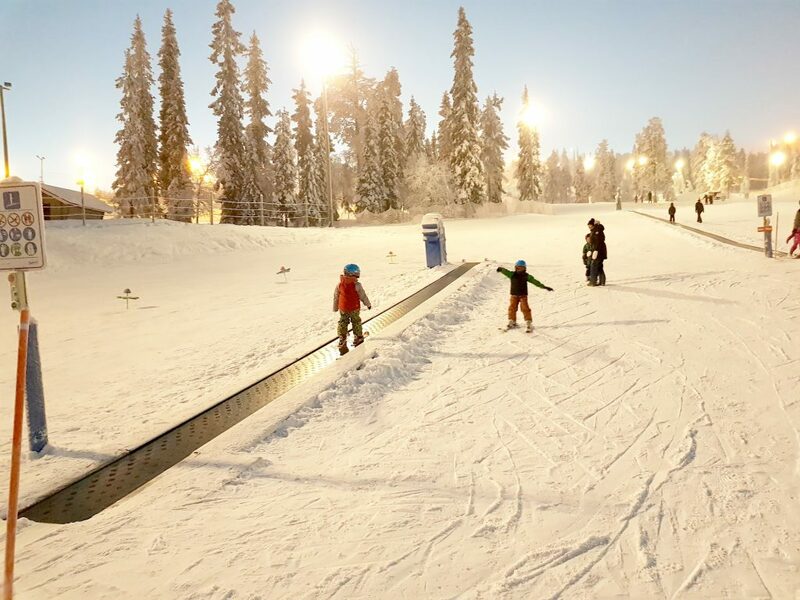 Ruka is one of the largest ski resorts in Finland, located 35km from the edge of the Arctic Circle and with a ski season that lasts more than 200 days, and Kuusamo Airport is just 25km away. We arrived just after lunch on 24 December. A walk and play in the snow had everyone whooping and smiling despite the -20°C temperature! The main Finnish celebration is on Christmas Eve, so we headed to the Restaurant Royal Ruka for a traditional Finnish Christmas dinner. We were surprised to find turkey on the menu and other similarities to a British Christmas dinner, but there were also differences, like pickled herring and a selection of strange “casseroles”. To the boys’ delight we met the “real” Father Christmas just before he set off to begin delivering gifts. On Christmas Day we opened presents then took our four- and six-year-old to their ski lessons while we hit the slopes. 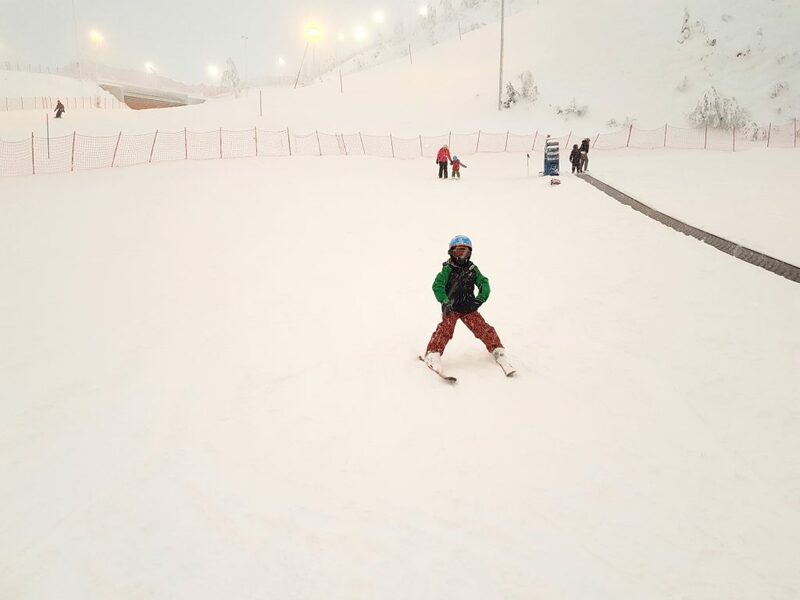 Ruka is small by Alpine standards, but snowboarding on Christmas Day was something I’d always wanted to do. There is 20km of piste over 35 runs with just 200m of vertical and the longest run just 1.3km long. But don’t let that put you off; the slopes are very good with pistes for all different abilities, an excellent park and plenty of off-piste. Although small, Ruka punches well above its weight. 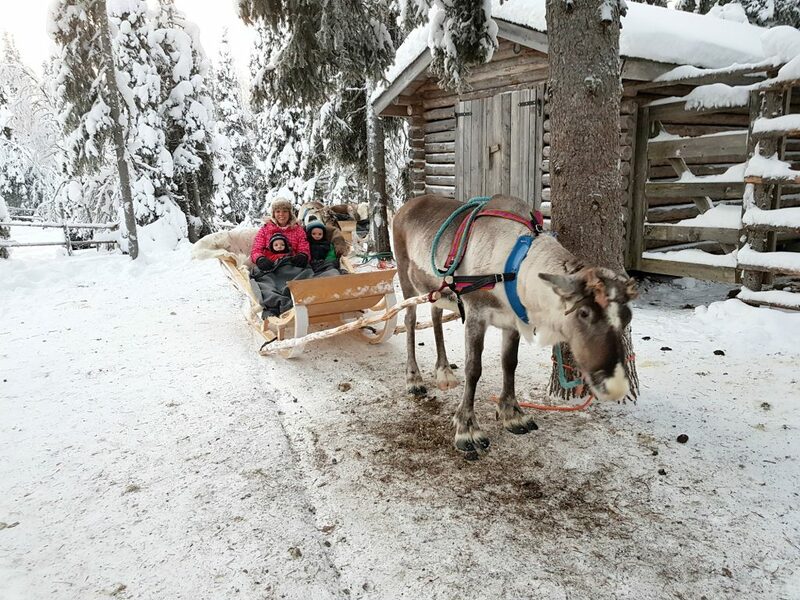 A trip to Lapland is about much more than skiing and Santa though. It has become a hub for winter activities from ice climbing to snowshoeing. 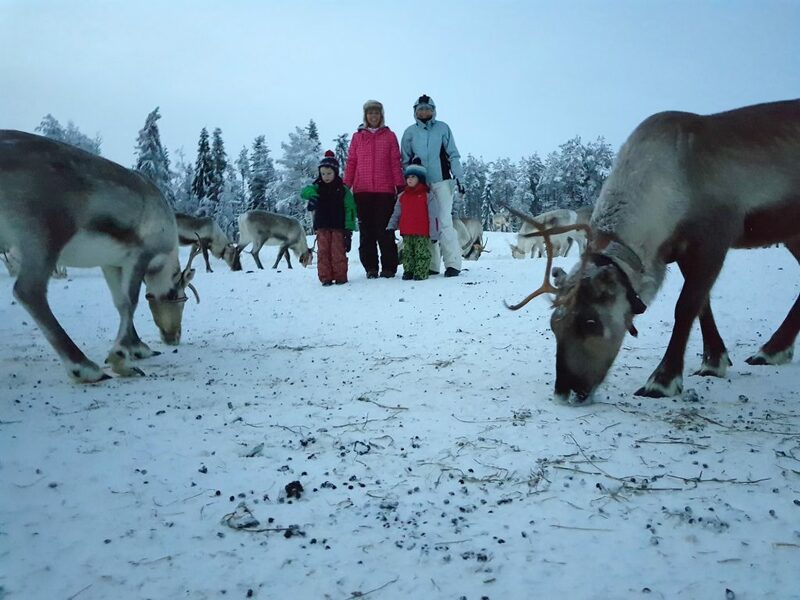 We stuck with the more family-friendly activities, starting with a trip to Kujala Reindeer Farm. Reindeer are an important part of the traditional Sami lifestyle; they’re semi-wild spending at least half the year roaming free only returning to their farm in the coldest months. Being in a field with hundreds of reindeer was a little daunting but also a magical experience. The kids loved feeding the hand-reared orphaned calves. Dog sledding had long been something I wanted to try, but I didn’t expect to be driving the dogs myself with my kids as passengers. The dogs set off at a breakneck speed, and we all laughed, squealed and giggled for most of the ride around the track at Lammintupa Winter Village. We also had a reindeer sleigh ride, not as fast as the dog sledding but being pulled around by Rudolph was just as special. There were also small snowmobiles older kids could try and a younger children’s play area. One evening we went in search of the Northern Lights on a snowmobile, kitted out in warm gear and reaching speeds of over 80kph, but unfortunately it was snowing so no chance of seeing the Aurora. The highlight of our trip was riding Icelandic horses in fresh snow at Wanha Raatesalmi. We rode into the woodland following a path that meandered through the snow-blanketed forest. The kids each had their own horse, and despite being nervous and new to riding they both loved it. 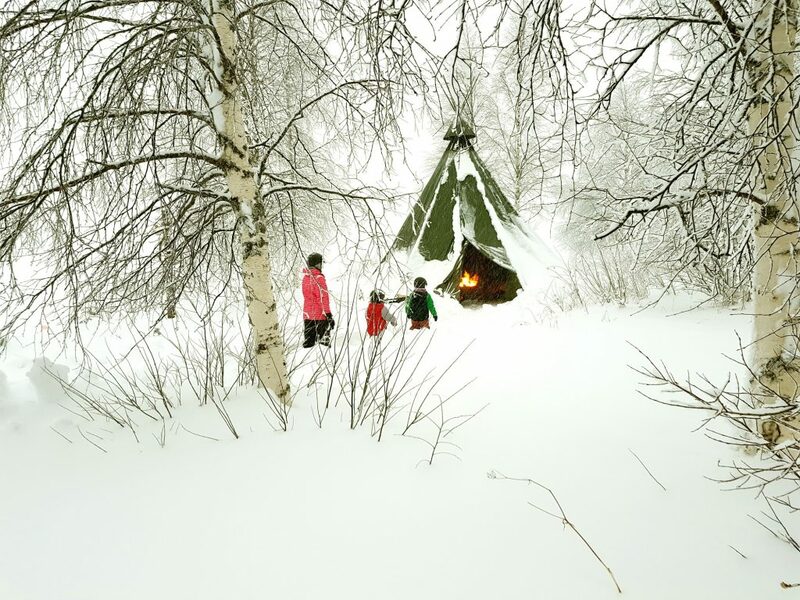 Afterwards we enjoyed hot chocolate and pancakes by the fire in a Lavvu (traditional Finnish teepee). The five of us stayed in the Ruka Suites in a compact but very functional apartment consisting of a double room, bunk room and pull-out sofa in the open-plan kitchen-living area, as well as bathroom, separate toilet and sauna. Staying in a self-catered apartment we cooked for ourselves using the fairly well-stocked supermarket and eating out a few times.The buffet at Restaurant Katlakivi was very good and I also recommend RU OK Burger. For lunch the all-you-can-eat soup at Villisika Restaurant is hard to beat. We will cherish the memories from our Christmas in Lapland. Yes, it was very cold, and it was sometimes a faff taking many layers on and off, but it was also fun, beautiful and exciting. A family trip to Ruka is something I thoroughly recommend.